On every platform, games have distinctive art styles to create strong associations in the minds of their users. But how do you decide between different aesthetics? Letting the audience decide via a preference test will give you strong data on which art style resonates most with users. The setup for this kind of tests is easy — just be sure to use images that convey similar messages or situations, so that you’re comparing apples to apples. 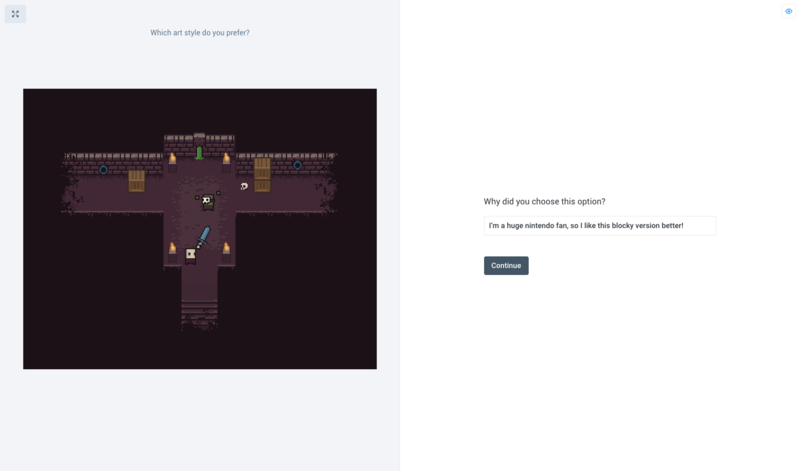 For example, the sample test has screens that show the same elements (walls, floors, characters, items, lighting, etc.) but in different configurations. Before the main event of the preference test, it’s useful to set up a couple of relevant survey questions, so that you know something about the behavior of your participants. It helps to understand their context, experience level with your kind of content, and any biases. It’s useful to add a ‘Why did you pick this option?’ question afterward, so that you soak up some of the opinions around the art styles. When you’re looking at the results, obviously the numbers are important, and hopefully, there is a clear winner that everyone loves. If there isn’t, try cutting down the number of options, or running off results in pairs. Definitely pay attention to the text responses as well, because there could be a single response (or a group of similar ones) which reveals a deep insight about one or all of the options. In the example test, the text responses to the ‘Why?’ question demonstrate that some see the sparse look of the Simple theme as a positive, but more participants see it negatively. The Simple theme resonates well with gamers that thrive on simpler graphics, which make the theme “more exciting due to the unknown”, to quote a response. This is a gem of a response. It nails exactly why the Simple style has appeal. However, if there were a lot of Nintendo fans in the game's target audience, the Detailed theme would be a better fit. Two of the responses that voted for the Detailed theme called out the throwback to the Zelda family of games. This is a strong association, but only for a specific type of gamer. This highlights the importance of reading the responses to get to the bottom of preference tests. Use them to inform and validate your artistic expression, rather than dictating a vision that may not resonate with you or your target audience.